Amalgamation is the process of combining multiple entities into one form. These pieces are amalgamations of form, color, and material properties. 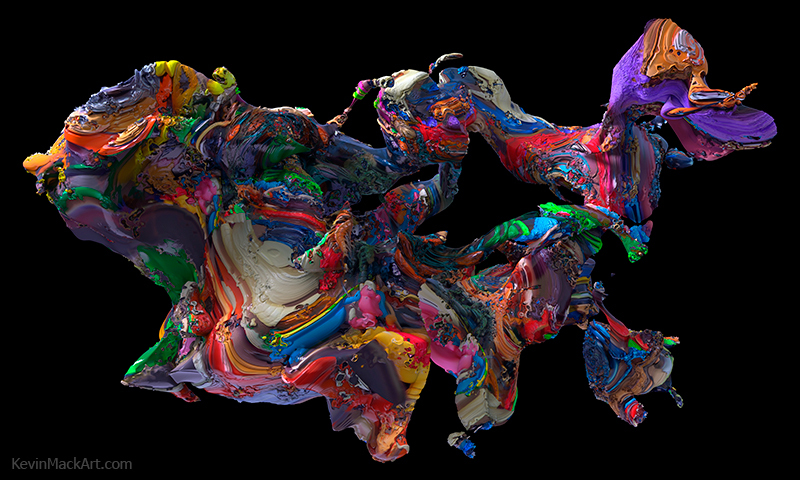 They are also amalgamations of procedural functions, directed randomness, deliberate design, abstraction, photorealism, sculpture and painting. They are depictions of the things I see in my dreams and visions. They are expressions of my aesthetic ideal. 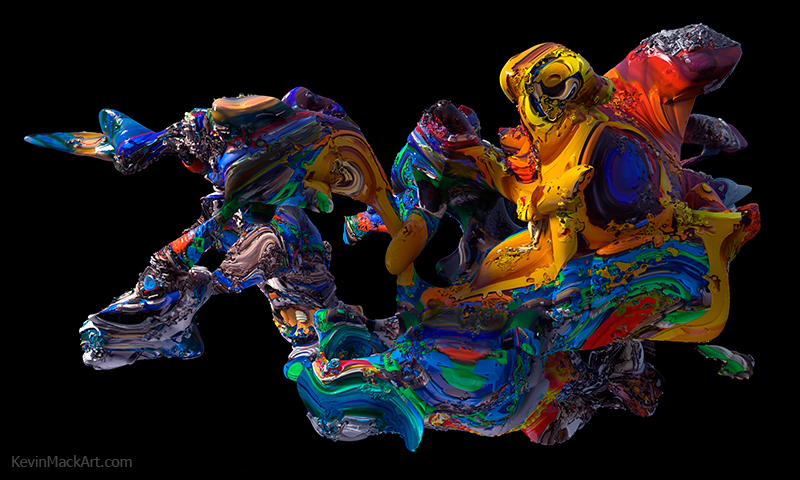 When I close my eyes I see an endless parade of vivid, three dimensional, animated abstract visions. These compelling hypnogogic visualizations and the ideas they inspire are fundamental to my work. I am fascinated with this abstract visual language. It's like the source code for consciousness. Rather than beginning with a specific goal or concept, I prefer to experiment, exploring the possibilities of various processes, discovering the work as I go. I use emergence and self organization as creative tools. I construct my own natural processes by defining the rules that govern them. I both emulate and diverge from real world natural processes to achieve a balance between familiarity and novelty. For these Amalgamations, I used directed randomness to create a variety of complex implicit surface geometries, which were then advected with my special blend of procedural noise functions. 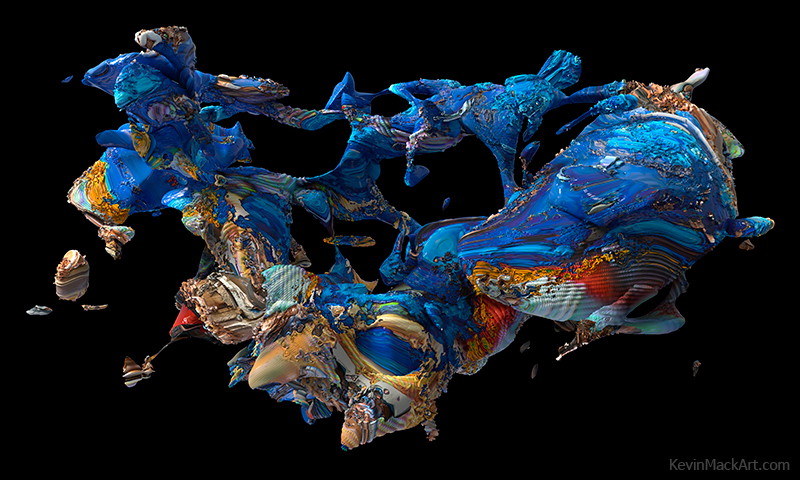 Variations of these functions are then used in conjunction with digitally painted images to add color, geometric complexity and physically based material properties. The lighting and rendering are also physically based. The result is virtual photographs, of virtual sculptures, of the things I see when I close my eyes. As I explore the space of possibilities in this process, I imagine many different interpretations. Sometimes I feel like I'm uncovering mysterious artifacts from a distant future. Other times I see them as living entities of advanced consciousness. Ultimately, they are intrinsically open to interpretation. The processes and inspirations behind my work may be complex, but the intention is simple; to inspire imagination, fascination, and contemplation - and hopefully provide a doorway from the finite to the infinite.